It is quick to make and you can use a healthy 'bread boat' for dipping bread pieces, vegetables or nacho chips for some variety. 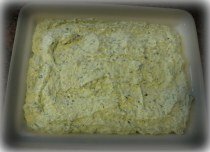 We have even used this spinach and cream cheese dip to make sandwiches for dinner as an alternative to a heavy evening meal. Parties and celebrations with this recipe arranged into a bread boat presentation with bread pieces, veggies and chips can make an ordinary party table into an exciting conversation table. You will love how quick and easy the 2 steps to this recipe are. Try it this weekend and see how your family will enjoy it. For parties and celebrations, you can expect this spinach dip to be gone first and fast. Whether you add raw cut vegetables like carrots, cucumber and peppers or nacho chips, place a sharp knife beside the bread boat and it too will get cut up and eaten as well. For at home as a part of a meal you might have some of the dip left over for another day--but we can't guarantee it won't all get eaten up in one sitting. 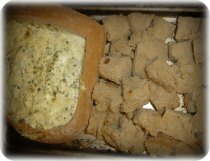 Leftover dip is great reheated in the oven for a few minutes and spread on toast or heated breads or buns as a sandwich. Add a spinach dip recipe to your next celebration and have a great party. This spinach dip can be fashioned in any kind of 'Bread Boat' not too stringy or dry and quick to make. Great every time & easy clean-up!